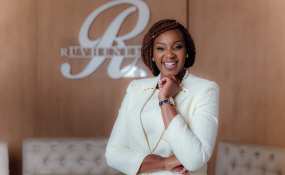 Top radio and television personality, Ruvheneko Parirenyatwa has taken to social media to try and gauge Zimbabweans' views on why they have chosen to remain in a country torn apart by political and economic strife. She posed a handful thought-provoking questions which she accompanied by an image of a tearful eye watermarked with the Zimbabwean flag. "Zimbabwe: Why are we still here? What is the one thing that has kept you in Zimbabwe?" wrote the outspoken daughter to former Health Minister and Zanu PF official David Parirenyatwa. She continued, "Why haven't you left the country to live somewhere else? What keeps you right here at home, through all this hardship?" Her comments, which she shared on her Facebook, Twitter and Instagram pages, received a surprise affirmation from popular Urban grooves crooner, Sanii Makhalima who said Zimbabweans were being treated worse than second-class citizens in their own country. "In Zim we are 780th class citizens imagine," he wrote, without stating by who. Some of those who took time to place their comments pointed out that despite the economic distress, they remained in their country as they needed to be close to their families. Parirenyatwa did not disclose why she sought those views although the tone of her questions suggested her misgivings over the deteriorating economic and political situation in the country. Despite her proximity to Zanu PF, biological or otherwise, Parirenyatwa has always exhibited independent thought as often shown by her tough questioning of top government and Zanu PF officials during her discussion shows on radio. She was last year fired from ZimPapers as radio and projects manager after hosting interview during which her guest, National Patriotic Front's Jealous Mawarire criticised Vice President Constantino Chiwenga and then British ambassador to Zimbabwe Catriona Laing. Her latest comments come after last week's fierce rioting by locals following a highly unpopular fuel price hike by government. The demonstrations, organised by Zimbabwe Congress of Trade Unions (ZCTU), led to clashes between ordinary citizens and security forces leading to several deaths and injuries.